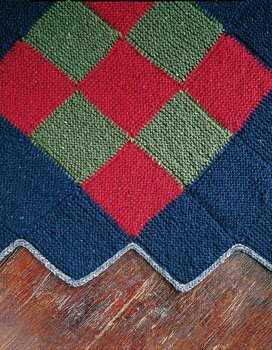 An easy afghan made up of small garter stitch blocks sewn together into larger blocks. A blanket that can be passed down through the years. Finished Size About 50" square. Yarn Rowan DK Tweed (100% wool; 120 yd [110 m]/50 g): #859 swallow (navy blue; MC), 13 skeins; #863 mustard (yellow), #850 wren (light natural), #861 mellow (light pink), #856 rowanberry (red), and #862 moody (medium blue), 2 skeins each; #865 mulberry (dark plum), #864 russet (terra-cotta), #866 lush (olive green), #851 cricket (medium natural taupe), #853 hare (medium brown), and #852 seal (medium gray), 1 skein each. Yarn distributed by Westminster Fibers. See Notes about yarn. Needles Size 5 (3.75 mm). Adjust needle size if necessary to obtain the correct gauge. • size E/4 (3.5 mm) crochet hook. Gauge 19 sts and 38 rows (including BO row) = 3¾" in garter st (diagonal measurement about 5").